Alexander Egorovich Varlamov (born November 27 [November, 15 O.S. ], 1801, Moscow – died 27 October [October, 15 O.S. 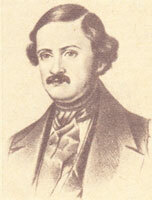 ], 1848, St. Petersburg) was Russian composer, singer (tenor) and teacher. He was one of the leading composers of the Russian romance, composing a great number of solo songs. Alexander Varlamov was born in 1801 in Moscow into the family of impoverished Moldavian nobles. Alexander’s father was a minor government official, a retired lieutenant. His musical talent was recognized early in childhood, Alexander played the violin and guitar by ear. His family could not afford to teach their talented child music. At the age of ten, he was sent to the Imperial Court Chapel in St. Petersburg where his voice attracted attention of Ukrainian-born composer Dmytro Bortniansky, who was then the director of the Chapel. Varlamov’s first musical and compositional training was with Bortniansky. After graduating from the Imperial Court Chapel, in 1819 he went to Hague and worked as a choral director of the Russian embassy church. While in Hague, Alexander frequented the opera and became acquainted with the Italian and French operatic repertoire. After four years in the Netherlands, in 1823 Varlamov returned to St. Petersburg. That year he began teaching solo singing at the St. Petersburg Theater School and served for a while as a chorister and teacher at the Court Chapel. During this period, he became well acquainted with Mikhail Glinka. Varlamov performed Glinka’s works, and took part in public concerts as a conductor and singer. In 1829 Varlamov was engaged as a chorister and voice teacher in the Court Chapel, he assumed the duties of training choirboys. In 1831 he resigned from the Chapel position. In 1832 Varlamov became assistant Kapellmeister of the Imperial Theaters in Moscow. In 1834 he was appointed a composer of Imperial Theatres. It was the 30s when Varlamov’s romances and songs started gaining in popularity. ‘Music needs soul,’ Varlamov wrote, ‘the Russians have it, and the proof is our folk songs’. In 1833 he compiled an Album of Music for 1833 (Muzykal’nyy al’bom na 1833 god) of romances and songs that brought him fame. He composed two ballets – Sultan’s Delight (Zabavy sultana), 1834, and The Sly Boy and the Cannibal (Khitryy mal’chik i lyudoyed), 1837, piano pieces, incidental music for plays, and a lot of solo songs to texts by famous Russian poets of his day, including Lermontov, Del’vig, Tsyganov, Kolt’sov and Fet. Varlamov was fascinated by the plot of Adam Mickiewicz’s poem Konrad Wallenrod and wanted to compose an opera, but his intention remained unfulfilled. In 1834 he founded his own music journal Aeolian Harp (Eolova arfa), in which his romances and piano pieces as well as the compositions of other composers were published. Varlamov spent his last three years in St. Petersburg, he hoped to get a position of a vocal teacher at the Court Chapel, but his hopes came to nothing. Varlamov was a member of literary and art clubs, he became well acquainted with Alexander Dargomyzhsky and Apollon Grigoryev. In 1846 Varlamov published a collection of his own folk song arrangements The Russian Singer (Russkiy Pevets). With amazing sincerity and ingenuousness, Varlamov expressed thoughts and feelings of his time and generation. His popularity was due to his ability to express himself in musical intonations which reflected Russian reality and the emotional experience of ordinary Russian people. One of his best known works is The Red Sundress (Krasnyy sarafan). Like his friend Aleksander Gurilyov, Varlamov spent most of his life in poverty. He died from tuberculosis at the age of forty-seven.